Having trouble solving the equations? Would you like to check your work? Download the answers to this free algebra worksheet by clicking here. 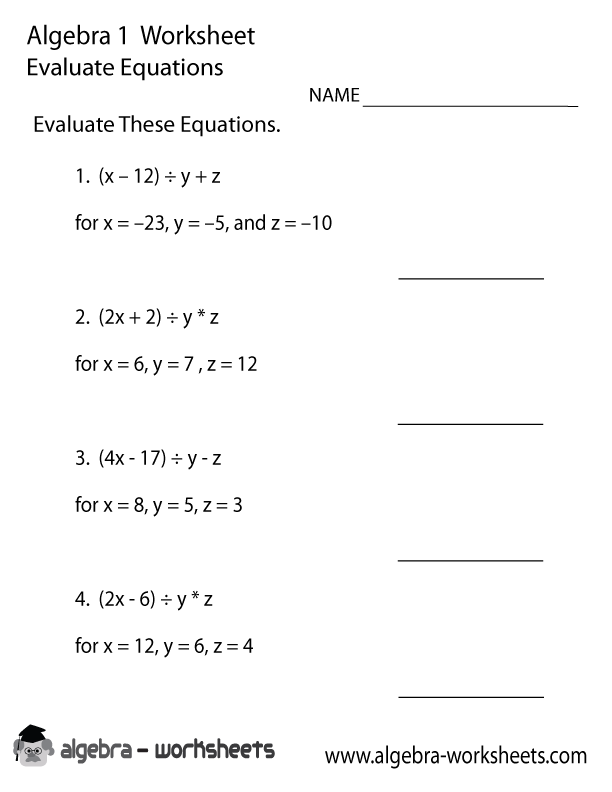 Download the Evaluate Equations Algebra 1 Worksheet PDF version and then print for best results. The online version of this algebra 1 worksheet can be completed in modern browsers like Safari, Chrome, Internet Explorer 9+, Opera, and Firefox. The easiest way to print the worksheet is by selecting the print icon. This will take you to the Evaluate Equations Algebra 1 Worksheet Printable that is optimized for printing inside of your web browser. The online version of the Evaluate Equations Algebra 1 Worksheet works on the iPad, iPhone, and other mobile devices. It is powered by HTML5. You can easily view and print the PDF versions of the algebra 1 worksheets using the free program called Adobe Reader.